Thank you for purchasing the Export Order Items plugin for WordPress and WooCommerce. This manual will guide you through installing and using the plugin. 5. 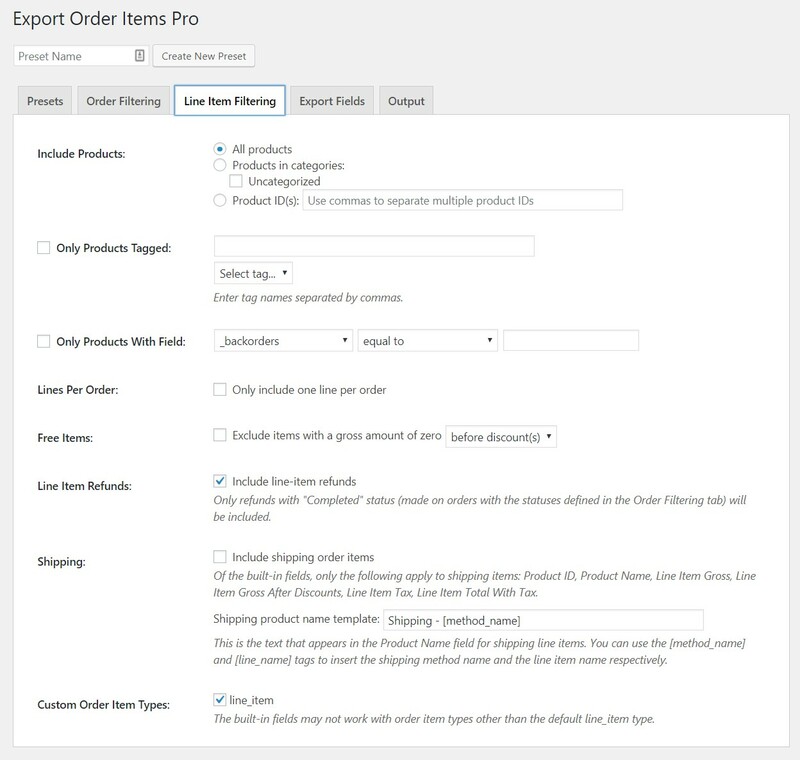 Select “WooCommerce” > “Export Order Items” from the left sidebar menu. The plugin is now installed and ready for use. Please note that you must also have the WooCommerce plugin installed and activated in order for the Export Order Items plugin to function. 1. In your WordPress Admin, select “WooCommerce” > “Export Order Items” from the left sidebar menu. 2. Optionally, load a previously saved export preset by selecting its name in the “Load Preset” field. ◦ Export Period: The period of time for which to export data. There are a number of preset periods available, as well as a “Custom date range” option which allows you to specify your own start and end dates for the export. ◦ Include Orders With Status: Limit the export to orders with the selected status(es); for example, you can export only line items from completed orders. 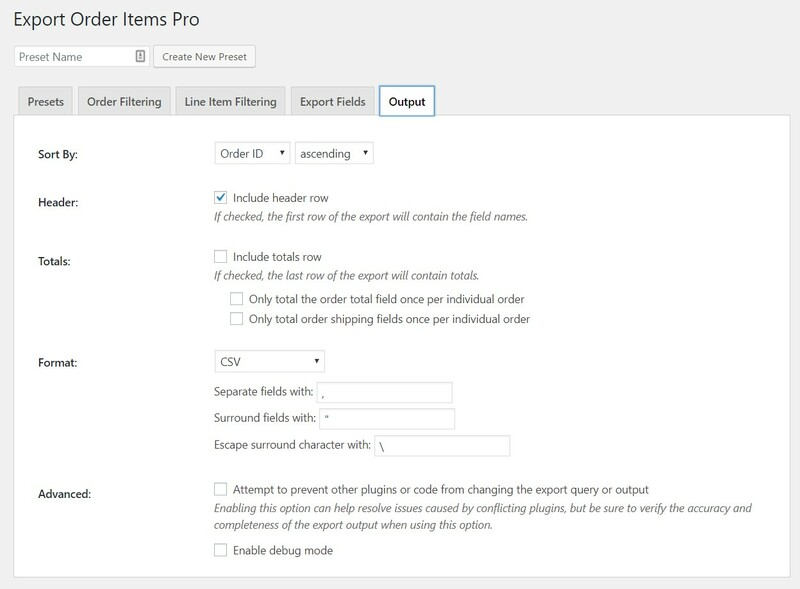 ◦ Only Orders With Field: If you enable this option and specify an order meta field or a customer user meta field and condition, only orders matching the specified condition will be included in the export. For example, if you use a plugin that records delivery dates associated with orders, you can export orders having a certain delivery date by choosing the delivery date field, selecting “equal to” as the condition, and enter the desired date. ◦ Include Orders by Customer Role: Filter orders by the role assigned to the user that the customer is logged in as when placing the order, or choose to export only orders placed by guests (customers who are not logged in at the time of placing the order). * To export order items for any product in your store, select “All products”. * To only export order items for products in one or more categories, select “Products in categories” and check off the categories to include. * To only export order items for one or more individual product(s), select “Product ID(s)” and enter the ID number(s) of the product(s), separated with commas. To determine the ID of a product, click “Products” in the left sidebar menu and hover over the product's title; the ID will be displayed below the title. * If you enable this option and specify one or more product tag names (separated by commas), only products with at least one of the specified tags will be included in the export. You can add tags to the field directly or by using the drop-down below the field. * If you enable this option and specify a product meta field and condition, only products matching the specified condition will be included in the export. For variable products, only the parent product is filtered (not individual variations). * If you enable the “Exclude items with a gross amount of zero” option, line items with a gross amount of zero before or after discounts (user-selectable) will be excluded from the export. * If you enable the “Include shipping order items” option, shipping line items will be included in the export along with product line items. Of the built-in fields, only the following apply to ship items: Product ID (shipping method ID), Product Name (shipping method name), Line Item Gross, Line Item Gross After Discounts, Line Item Tax, Line Item Total With Tax. * Check the box next to the field name to include that field in the export. * If the “Include totals row” option is enabled in the Output tab, check the “TOTAL” checkbox to the right of a field name (where applicable) to include that field in the export's totals row. * Drag-and-drop the field names to change their order. * Edit a field name to change how it is displayed in the export file header, if applicable. 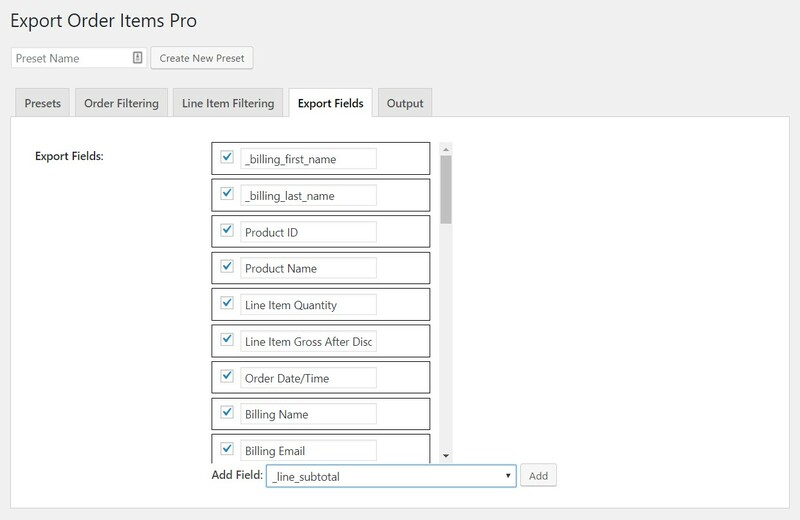 * To include a custom field defined by WooCommerce or another plugin, select the field ID in the Custom Field dropdown and click Add. * Include header row: Uncheck this option if you do not want the field names included as the first row of the export file. * Include totals row: Enable this option to include a row of totals at the end of the export file. The fields to be totalled can be selected in the Export Fields tab. * Format: Select the file format of the export data file. 4. 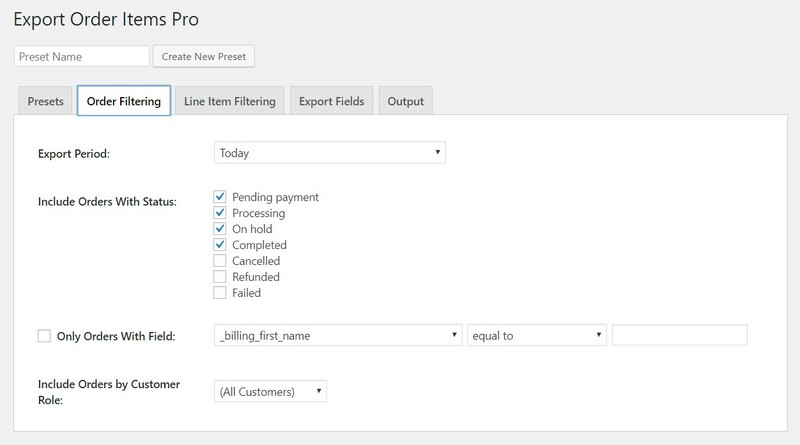 Enter a preset name in the Create New Preset field if you would like to save your export options for future use. 5. Click “ Export” to generate the data file. If you require support for this product, please e-mail us at help@potentplugins.com. Support is available for one year from date of purchase.